Coming May I will take part in the portrait month again. This time with much more days. Anyone is welcome to join as painter, model – or just drop by and watch the artsy action and exiting exhibition. 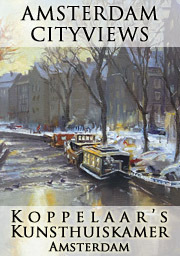 We will be painting from May 18 until June 3 (2012) in the windows of Gallery De Stoker in Amsterdam. Since there are sessions every Friday, Saturday and Sunday, there is lots of opportunity to join. We also need lots of voluntaries for models – so please drop the organizers a mail (also if you want to paint). All details and the agenda can be found on the website of Maroesja Lacunes. It will be quite relaxed sessions of four hours, with lots of breaks. Personally I will have some of my portraits there, and will try to portraitize at least every Sunday, and lead the first Saturday and Sunday. I’m kinda secretly pondering to make some “Portraits of Amsterdam” exposition with my works in the future. So it’s a good chance to produce! 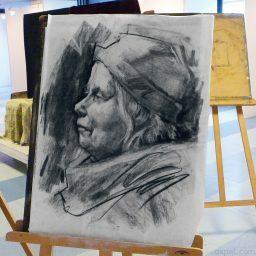 Below is the Dutch flyer for the Portrait Month (whoo, I’m even on it…. twice! ), and for the model sessions every Sunday in the studio downstairs. Flyer Portrait Month in Gallery De Stoker. Sundays there are model sessions each week. Artists are welcome to join.